I’ve been eating at various Papayas around the city for pretty much my entire life. Anyone who grew up in NYC knows they’re as ubiquitous as Ray’s pizza, except they are generally uniformly better. I’ve always liked the Papaya franchise, there’s something supremely New York-y about a hot dog, and they always do a pretty good job of it. 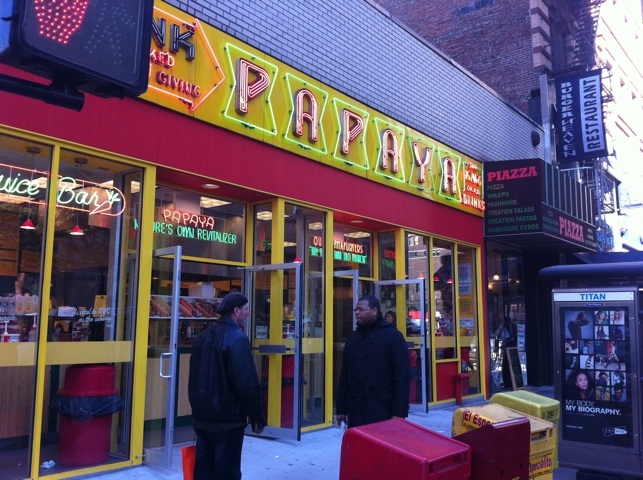 Any real New Yorker, though, would tell you that the “best in show” of the Papayas is the Papaya King on the Upper East Side – 86th and 3rd. 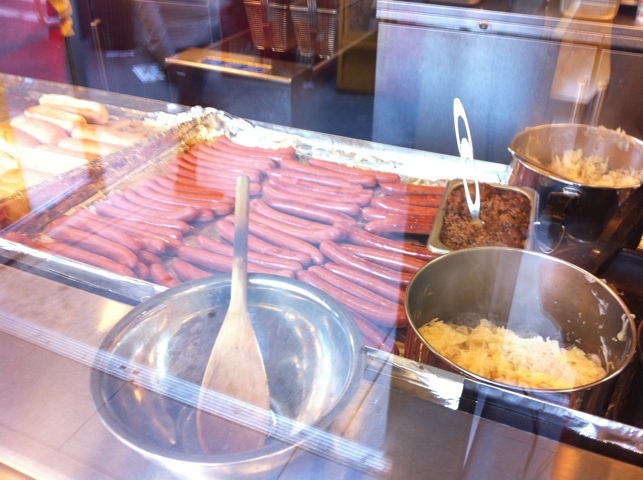 The legend (and I believe it to be fact) is that they receive their own special mix for their hot dogs, and it’s generally agreed amongst foodies that there’s is tops amongst the chain. I usually stop in when in that neighborhood, and thought it prudent to do so after their recent renovation. 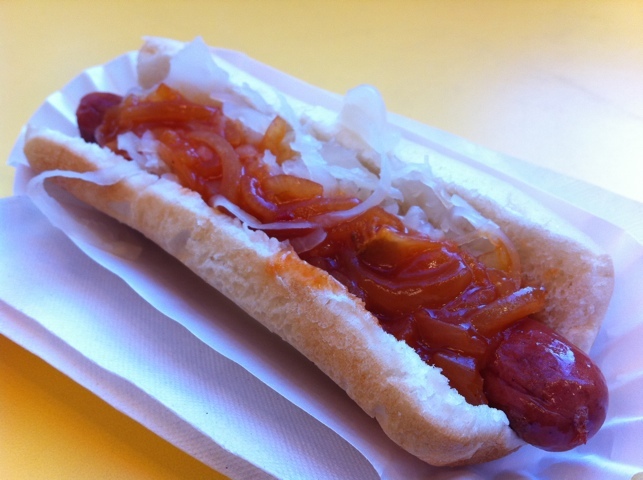 A Home Run: mustard, kraut and onions. It was $4.61 for a Home Run (a dog with mustard, kraut and onions) and a medium papaya drink (their signature, naturally). That’s much more than most of the papaya chain, and I think more than most people would ordinarily want to pay for a single dog even if it comes with the delicious beverage. A dog should be about a buck, two for two, you know, and then another two for the drink. Seems pricey. It does have a very good, tight snap. It’s with great disappointment that I report that the dog, while good, is not great. It does possess a very good snap, and the beef flavor is present, albeit muted. It’s greasy from sitting on the skillet surface. 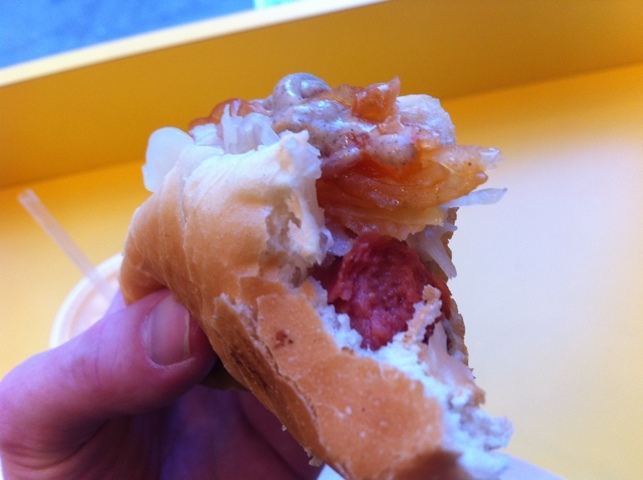 But, speaking frankly, it’s not as good as the dog from Artie’s.